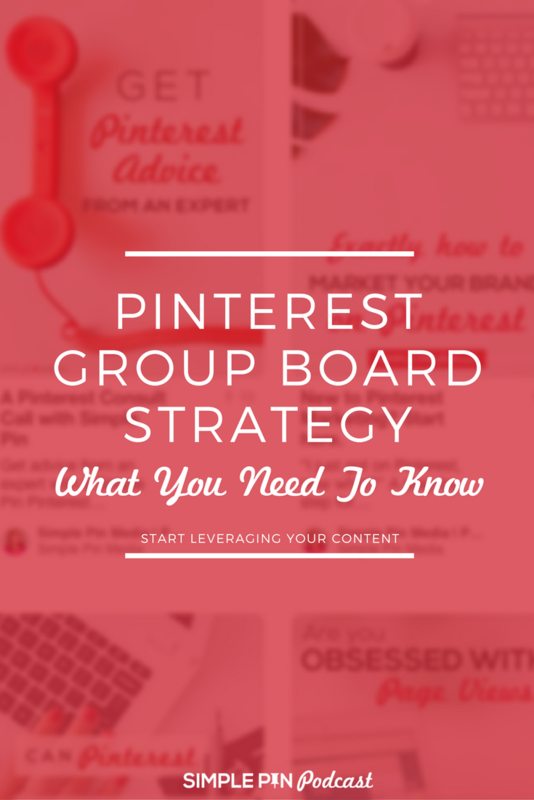 Today we are tackling a topic that I get asked about all the time: Pinterest group boards. I have Louise Myers of Visual Social Media with me today. I’m excited to have her here because she is so knowledgeable about this topic. Louise comes from a graphic design background and has been doing freelance graphic design for decades. Currently, she authors a blog that helps people make their own designs, since visual marketing is so incredibly important in this social media and content marketing era. Pre-2014, Pinterest gave us the opportunity to create and join group boards. The idea was that multiple people could share content on the same board. When marketers and bloggers used group boards as an opportunity to get their content in front of new audiences. In 2014, the Pinterest algorithm changed to what we have today — where the feed is not follower or chronologically based. In 2015, we saw a huge wave of group boards become seemingly useless. Ever since then, there’s been this drive to try and figure out how to make group boards relevant again. There’s a philosophy out there that you should join all the group boards you can and post as much content as possible to those boards. This isn’t a good strategy. 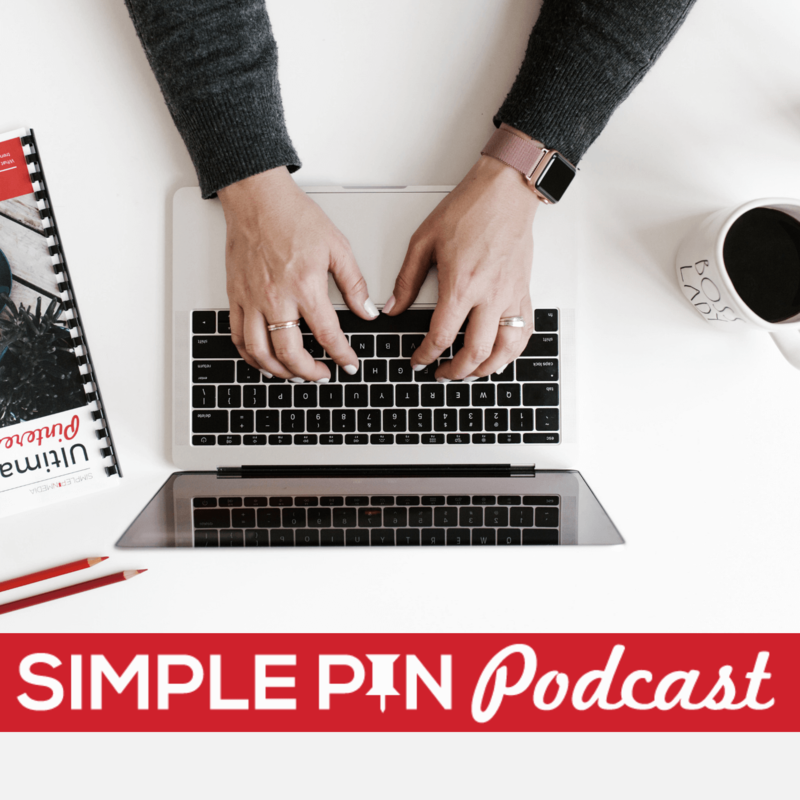 If you’re on boards that are full of spam or pins that don’t fit your niche, you’re in what Louise calls a “bad neighborhood.” Don’t hang out in places where you aren’t around your people because that doesn’t benefit you in the long run. Here at Simple Pin, we use “gates” to evaluate group boards. First, we look for the name of the group board and at the number of contributors to a group board. That is an indicator of the health of the board. If there’s a group board with over 500 contributors, there’s the risk of spam or irrelevant content, and it can get out of control. The third “gate” pertains to the content of the group board. Do you want your audience to see the content of the board? Is it a “neighborhood” you want to be a part of? If not, it’s better to avoid that board. Louise received a question from someone who just started using Pinterest about four months ago. They asked her why it was so difficult to get followers and repins given that they belonged to over 50 group boards. Once she dug into the analytics, she realized that these boards have less than a 1% repin rate. Joining tons of group boards was a great strategy for gaining followers and repins pre-2014, but not so much today. Louise evaluates her group boards about once a month. She uses Tailwind. Another quick way to evaluate is to look at your Pinterest analytics and check out the boards with top pin impressions. Another super helpful tool that Tailwind offers is the pin inspector. It’s the best way to get really specific information on how your pins are performing. It shows you how many pins you added to the board and adds up your repins. How Do I Find And Join Group Boards? You can use sites like PinGroupie to find lists of group boards by niche. There is also a Facebook group called Pinterest Group Boards. Another way is to check profiles of pinners in your niche. The last way (and probably the best), is to network with your business friends or in a Facebook group. Joining boards can take a fair amount of time and tenacity. The first thing you have to do if you’re trying to join the board of an influencer is to respect the rules of connecting with them. Pin their content, join their Facebook group, etc. Be genuinely helpful. Check the group board description and see if they’ve left any instructions about how to join. If they say they aren’t accepting any more users, respect that and don’t harass them. If they haven’t left instructions, you can try contacting them through a Facebook group or their website. If you know someone who is a contributor to the group board, you can see if they can add you. Another question we get asked a lot is whether boards with a lot of followers are better than boards with fewer followers. You want to join boards with people who have close to the same audience size as you do. This is why open group boards don’t really work (they are accept people who don’t have an authoritative presence on Pinterest yet). We are all looking for the magic answer to all questions related to Pinterest. Unfortunately, there aren’t any magic answers. Louise has about twice as many personal boards as she does group boards. You cannot neglect your personal boards for the sake of group boards. Personal boards typically perform better than group boards because you own them and control everything that is posted on them. Louise doesn’t pay as much attention to her group boards, but she ranks them by performance. 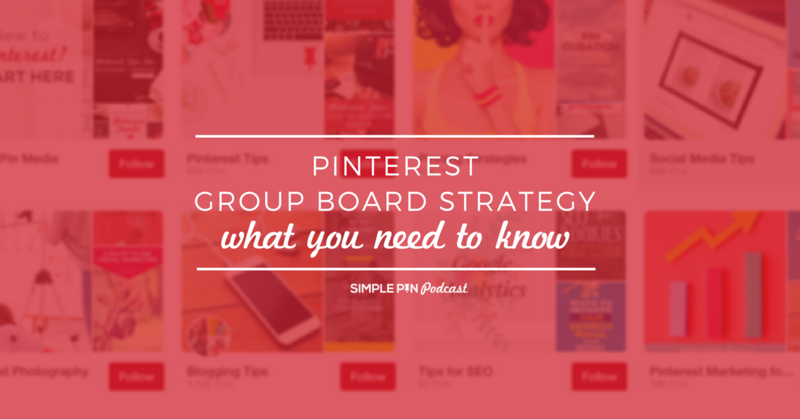 When she creates a new blog post, she pins it to her best boards first and intersperses pins to her group boards. She uses group boards as a supplement. Avoid being “spammy” on a group board. Don’t invite anyone to a group board that you wouldn’t invite to a dinner party. When there’s a small group of people with content that you know you want to share with your audience, that’s a good time to start a group board. It’s all about collaborating with people you know. Get back to the basics. Then there’s no pressure as far as managing that board. We’ve talked about group boards, but let’s not forget about Tailwind tribes and Facebook share threads. Looking at all three of those options, is there a benefit to one of them over the others? And is it necessary to use all of them? Louise hasn’t participated in Facebook share threads and she would avoid them if they require you to share every pin that’s being posted in the thread. You want to pick and choose the content you’re most likely to share with your best friend. With Tailwind tribes, you can choose what content you want to share which is a huge benefit. Also, tribes are the only one of the three where you can monitor whether or not people are actually following the sharing rules. Group boards can perform well. It’s not all gloom and doom. For those of you who are evaluating your group boards, no one gets a notification if you leave the group board. And if you leave the group board, don’t worry about automatically joining a new one. Group boards can be helpful but you’re going to get a lot more bang for your buck by working on things you can control and two of those things are your content and your keywords! 23:20 – How Do I Find and Join Group Boards? Get a jump start on cleaning up your Pinterest boards. Download our FREE printable Pinterest clean-up sheet making it easy to organize your boards. You’re on the right track! Don’t forget the keywords too. You’ll definitely find lots of helpful advice on Kate’s blog. Thank you so much for this post! I have been in marketing for a while but pinterest marketing is a new horizon I’ve been working on the past month. I was just about to really dive into group boards and do all the things you said not to do. Can’t wait to read more of your content! There’s so much outdated (and just plain bad) Pinterest information circulating online! Good for you for scoping things out in advance. I’m sure you’ll do well! I’d love some clarification on one of your points. (For reference, I’ve been on Pinterest a long time – since it was live feed in real time.) You mentioned leaving group boards and starting your own individual board with the same topic. I’ve started some boards in the past few months that have gone NOWHERE. Even after a month there would be say 20 pins and not ONE repin. I started the boards with a mix of my own pins and pins I searched for for that topic. I’ve wondered if Pinterest “penalizes” us if we do too much pinning at once. It seems that the nights I’ve worked to set up new boards that the pins from that evening never do well, even on my own better established boards. Do you have any suggestions or best practices for starting new boards? Hi Sallie! No, not at all. I would NOT recommend starting your own board with the same topic as a group board that’s performing poorly enough to make you leave. Many of those aren’t performing because they’re too broad. What I suggest (and do myself) is to create a board with a highly-niched topic pertinent to my blog. I even did this recently with my own group board that I closed to contributors. I niched it down from “Business Bloggers” to “Social Media Image Sizes.” It’s only been 2 weeks and this board has totally taken off. Kate has a podcast and blog post on boards. I’m sure that will help. Thanks for your reply. I should have been mores specific. The new boards I started are niche boards that apply to my topic. But even then they have not started well. Which goes back to the wondering if Pinterest penalizes for doing too much at once. I know it recently came out that the first five pins of the day get priority as does the board(s) they are pinned to. I’m wondering out loud if it is somehow all related. You also just made me stop in my tracks with some group boards that I was considering applying to. There was one that had so many rules, I don’ know how anyone finds it helpful lol. Going to focus more on my personal boards that are doing well. This also has me thinking about the group board that I started a little while back. I really wish I would have thought about it more as a small “neighborhood” of bloggers I know/trust. My group board is small and easy to manage at this point, but I’m definitely going to keep tracking the stats on it. Thanks Ladies! Good stuff (as usual)! Yay!! So glad it was helpful. I’ve been just been told that my formerly effective strategy of pinning regularly to groupboards is causing my traffic to tank. Advice was to archive all my groupboards and remove collaborators from the groupboards I own. Does this advice align with the latest best practices you’re aware of? Traffic dropping off badly!